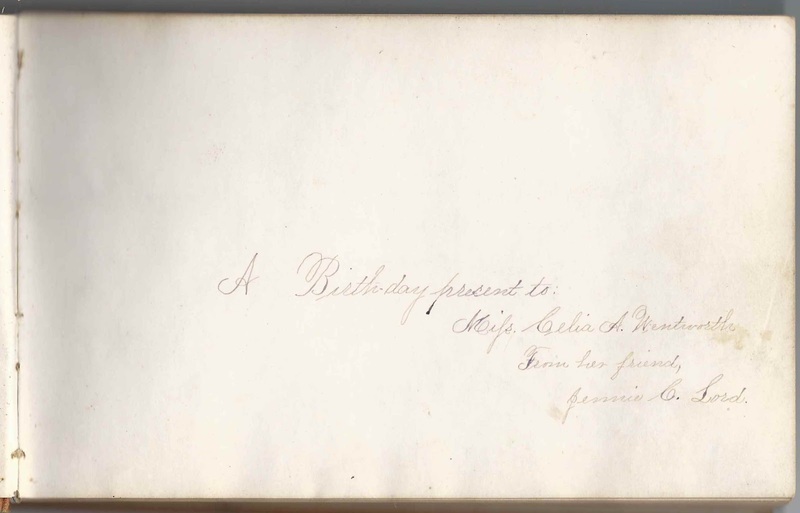 1870s/1880s autograph album that was presented to Celia A. Wentworth of West Lebanon, Maine, on the occasion of her birthday, by Jennie C. Lord of East Lebanon, Maine. Celia's birthday was 10 September, 1855, and the year she received the album was presumably 1878. 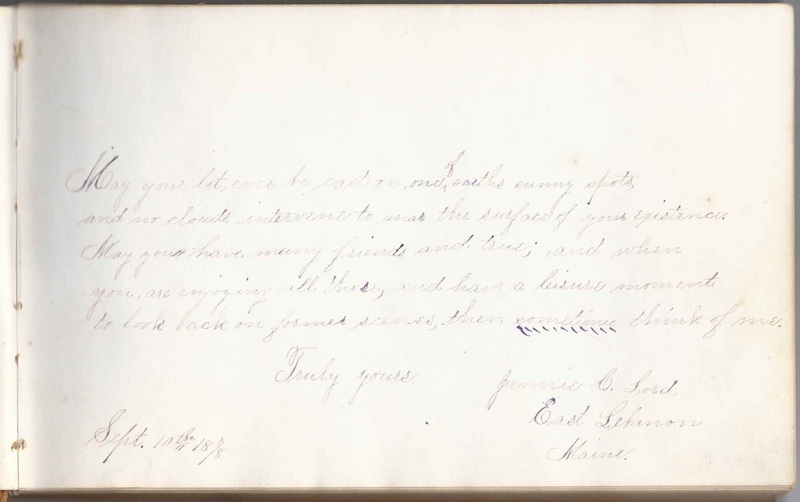 In fact, Jennie signed the next page in the album at East Lebanon, Maine, on 10 September 1878. Jennie was the daughter of Hiram and Elizabeth Lord and would marry William T. Richards at Erving, Massachusetts, on 23 October 1888. The album is approximately 8" x 5" and contains the sentiments of 67 of Celia's relatives, friends and students. An alphabetical list of the signers appears at the end of this post. Celia A. Wentworth was born 10 September 1878 at Lebanon, Maine, the daughter of Samuel W. Wentworth and Lucinda (Jones) Wentworth, both Lebanon, Maine, natives. Celia's parents signed facing pages in the album, Samuel on 4 June 1884 and Lucinda on 18 October 1880. Lucinda signed another page in the album, on the same date, 18 October 1880. Celia's paternal grandparents were Samuel and Rachel (Forbush) Wentworth. Her maternal grandparents were Ephraim and Catherine (Wentworth) Jones. 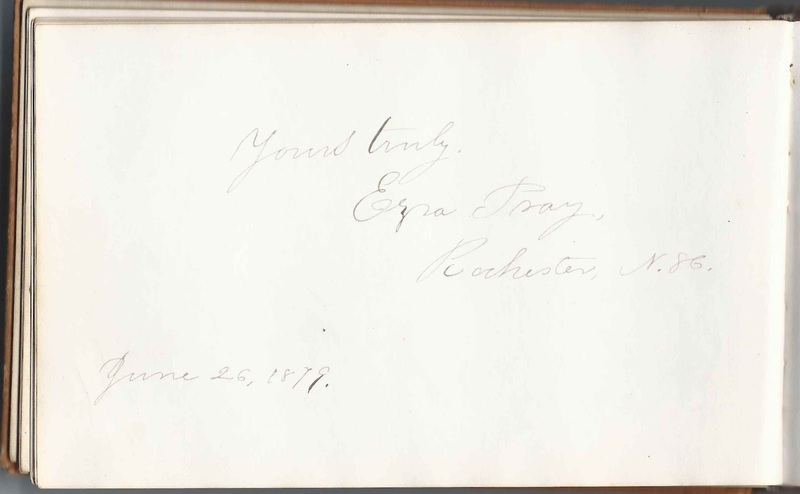 Celia's brother Harry Alphonse Wentworth and his wife signed facing pages at West Lebanon, Maine, on 12 August 1883. Apparently Celia spent some time as a school teacher or Sunday School teacher, as a few of the signers indicated they were her pupils. On 30 March 1898, Celia became the third wife of widower Freeman Foss Sanborn, son of James and Mary C. (Guliver) Sanborn. His previous wives were Lydia Senter, with whom he had a daughter and son, and Leonora E. Hanscom. Freeman died in 1909 and Celia in 1921. Two of the signers were Ezra Pray and his wife Martha J. (Hanson) Pray, who signed at Rochester, New Hampshire, on June 26, 1879. Ezra Pray was a naval surgeon during the Civil War who kept a diary of his service that was acquired by the Naval Historical Association a few years ago, scanned and transcribed and then donated to U. S. Navy Medical Department Office of the Historian at Washington, D.C.
Fannie W. Adams, signed at Kittery, Maine, on August 25, 1879; Celia's cousin. She was the daughter of Augustus and Hannah Adams. She was Fanny Wentworth Adams, daughter of Augustus Hamilton Adams and Hannah (Jones) Hamilton. Mrs. A. H. Chase of Kittery, Maine, signed on August 26, 1879. 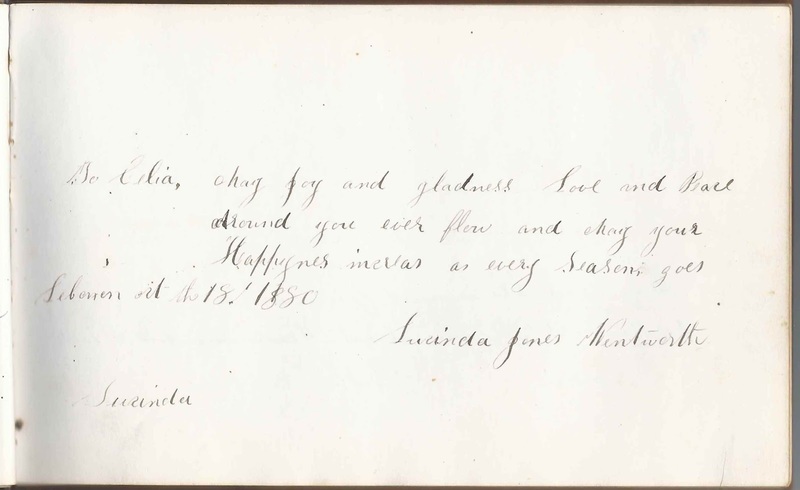 "Your friend and cousin"
Minnettie E. Cushing of Rochester, New Hampshire, signed on December 22, 1878. Presumably Minnetta E. Cushing, daughter of Samuel and Almira Cushing; Minnettie married Nelson Nutter at Dover, New Hampshire, on 26 January 1884. Addie M. French of Gilmanton, New Hampshire, signed on January 8, 1881. 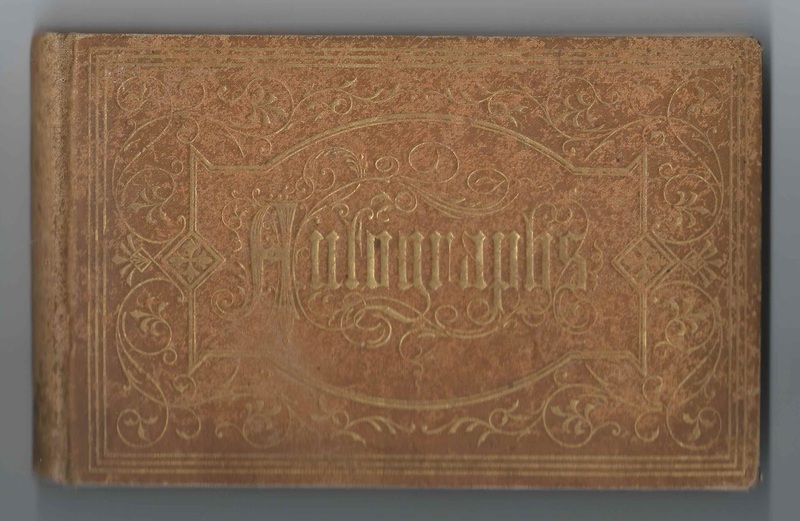 Her future husband, William F. Wallace, signed the left facing page in 1886. Daniel W. Gerrish of Rochester, New Hampshire, signed on March 30, 1885. 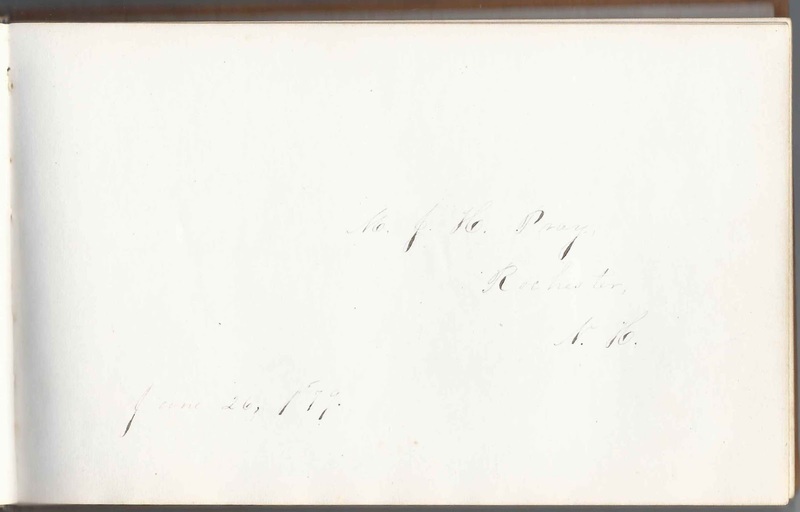 His wife, Emma P. (Dillingham) Gerrish, signed the right facing page. E. D. Gerrish of Rochester, New Hampshire. She was Emma P. (Dillingham) Gerrish, whose husband Daniel Gerrish signed the left facing page. B. C. Hurd of West Lebanon, Maine, signed on August 10, 1879. Benjamin C. Hurd, father of Ella C. Hurd who signed the right facing page, and William W. Hurd, who signed the overleaf of Ella's page. Ella C. Hurd of West Lebanon, Maine, signed on August 10, 1879. Daughter of Benjamin C. Hurd, who signed the left facing page, and sister of William W. Hurd, who signed the overleaf. W. W. Hurd of West Lebanon, Maine, signed on August 7, 1879. William W. Hurd, whose sister Ella C. Hurd and father Benjamin C. Hurd also signed pages in the album. Nettie R. Jacobs of Rochester, New Hampshire, signed on December 12, 1878. Kate W. Lingley of Wollaston Heights, Massachusetts. She was Catherine W. (Goldthwaite) Lingley, whose husband John W. Lingley signed the right facing page. Their daughter Annie Valoret Lingley also signed a page. John W. Lingley of Wollaston Heights, Massachusetts. 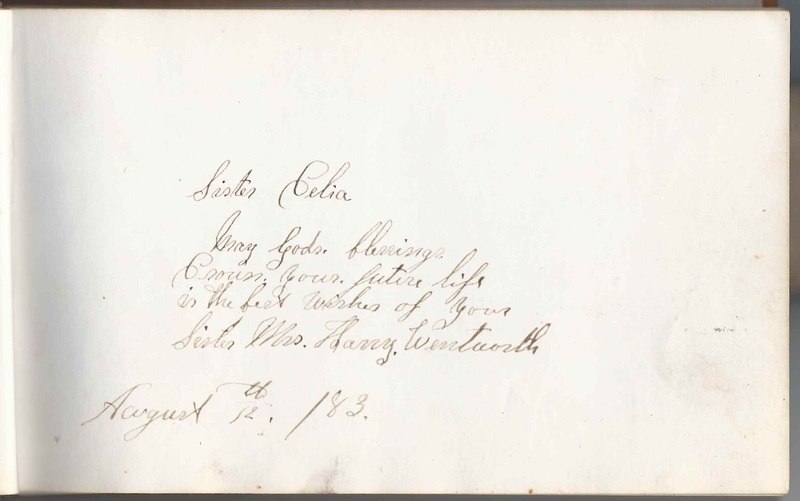 His wife, Catherine W. Goldthwaite) Lingley, signed the left facing page. Their daughter Annie Valoret Lingley also signed a page. Jennie C. Lord of East Lebanon, Maine, signed on September 10, 1878. She inscribed the presentation page, where she noted that she gave the album to Celia at her birthday. She was the daughter of Hiram and Elizabeth Lord of Lebanon, Maine, and would marry William T. Richards at Erving, Massachusetts, on 23 October 1888. Mrs. M. E. Parshley of Rochester, New Hampshire. Presumably Mrs. Martha E. C. (Kimball) Parshley, wife of Albert J. Parshley and mother of several signers in the album. M. J. H. Pray of Rochester, New Hampshire, signed June 26, 1879. She was Martha Jane (Hanson) Pray, daughter of Hiram and Eliza (Gerrish) Hanson, whose husband Ezra Pray signed the left facing page. Irving F. Shorey of Rochester, New Hampshire, signed in 1878; Celia's "scholar"
S. L. Thompson. 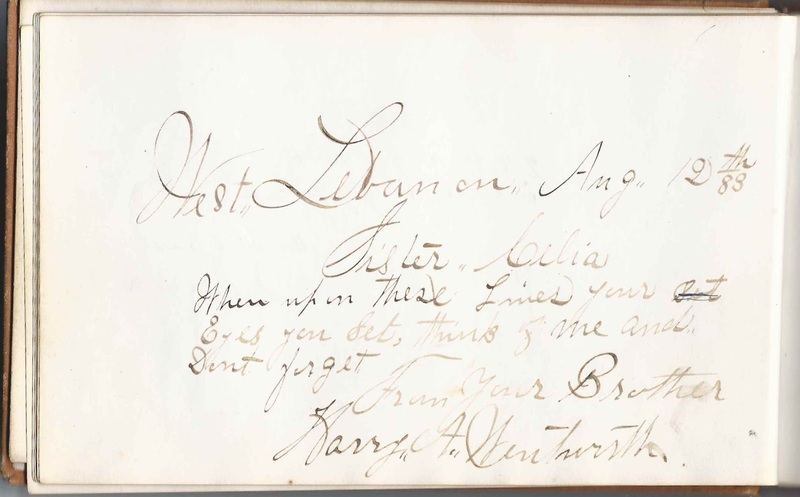 The signer was Sarah L. (Davis) Thompson, whose husband Usher B. Thompson signed the right facing page. U. B. Thompson of Kittery, Maine, signed on August 19, 1879. Usher B. Thompson, whose wife Sarah L. (Davis) Thompson signed the left facing page. He served in the Maine Legislature and was a York County Sheriff. W. F. Wallace, signed February 27, 1886; "Gale 120 miles per hour". His future wife, Addie M. French, whom he married on 11 April 1883, had signed the right facing page in 1881. Harry A. Wentworth, signed at West Lebanaon, Maine, on August 12, 1883. Celia's brother Harry Alphonse Wentworth, born 30 October 1860 at Lebanon, Maine. His wife signed the right facing page. Mrs. Harry Wentworth, signed on August 12, 1883; her husband, Harry Alphonse Wentworth, signed the left facing page. 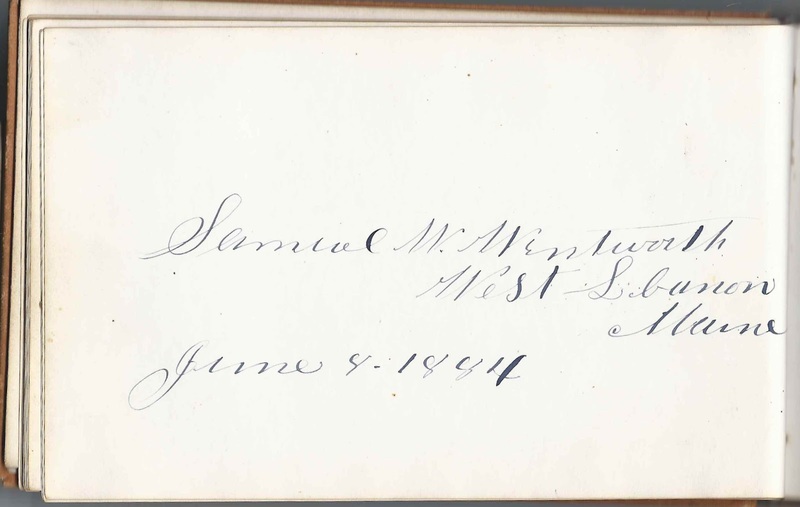 Samuel W. Wentworth of West Lebanon, Maine, signed on June 6, 1884. 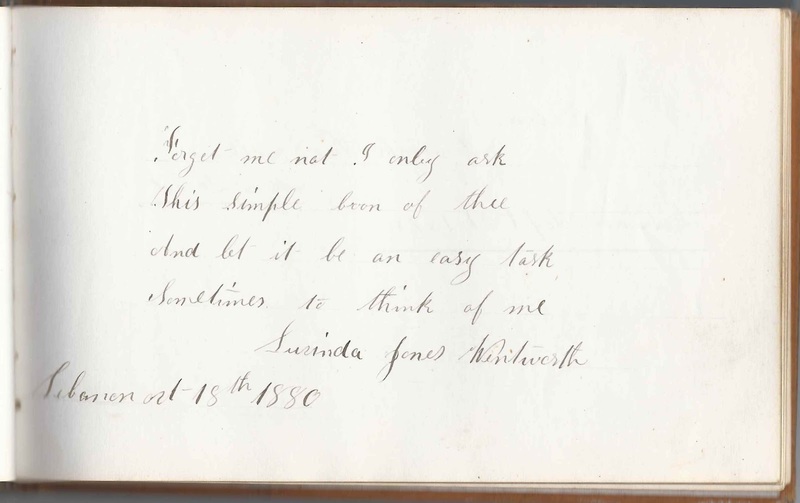 Celia's father, whose wife and Celia's mother, Lucinda (Jones) Wentworth, signed the right facing page. Lucinda Jones Wentworth, signed at Lebanon, Maine, on October 18, 1880; Celia's mother. Her husband Samuel W. Wentworth signed the left facing page. Lucinda signed another page in the album as well. A. R. Wentworth of Kittery, Maine, signed on August 22, 1879. Presumably Andrew R. Wentworth, son of Andrew Pepperell Wentworth and Sarah Ann (Jones) Wentworth. He was born 19 October 1859 and died 13 April 1921. M. Estella Wentworth of Kittery, Maine, signed on August 22, 1879. Presumably Mary Estella Wentworth, daughter of Andrew Pepperell Wentworth and Sarah Ann (Jones) Wentworth and sister of signer Andrew R. Wentworth. Miss Emma Williams of York, Maine, signed on August 23, 1879; she wrote on the page upside down. Pam, I'm interested in this album also.